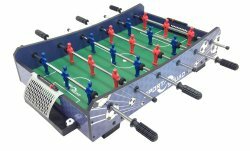 Best Foosball Table Reviews - Check Our Complete Guide! 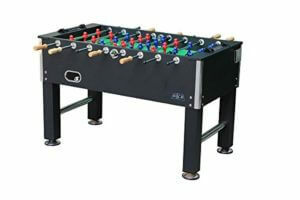 Are you looking to find or are you having problems to find best foosball table? Don’t worry, we know how you well and because of this we will try to help you, so you will your favorite one. There are many different models available on the market, so it is natural that you are having a hard time choosing the right one. We have made a complete guide where we talk and mention different best foosball table reviews, different brands that are available, types and sizes you can choose from. We want that our visitors really get all the info that they need, so we also described how to choose them and what you have to look. We have also mentioned who can use them and what are other accessories that you may need. Of course, you can help also other problems with management, so we also got that covered. Take a look below and find the model that suits you best if you are a beginner or an advanced level player. Best foosball tables by our choice! 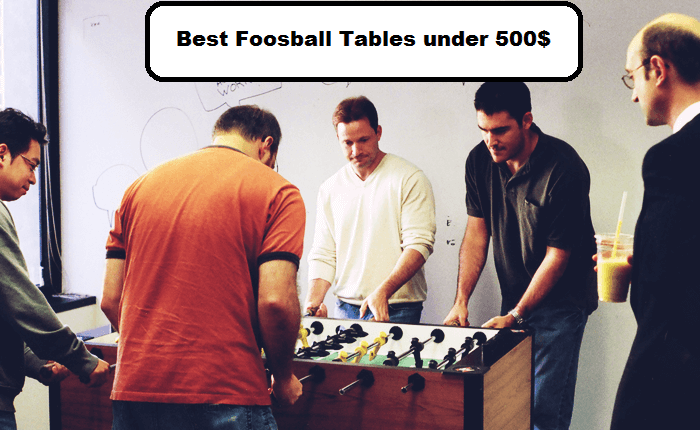 Here we have listed our 5 best foosball tables, so you don’t have to look all around if you want to know which are those really good right away. Here are the reviews of best models! 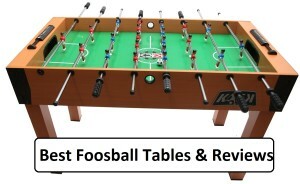 Maybe you are interested in a few models mentioned above and you want to know more about them, so we made reviews of our top rated foosball tables picks. If you want more reviews on different models, jump to review category, where you will find more models. 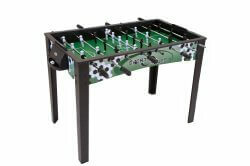 1 Best foosball tables by our choice! 2 Here are the reviews of best models! 3 How to choose them? 3.2 Who can use them? 3.3 Don’t know which brand to choose? 3.5 Looking for a specific size? 4 Looking for a best or certain price? 5 What about other accessories? 5.1 Are you having problems? 5.2 Don’t know what to do next? Here is our first high-quality foosball table that we must to point out. It’s the Kick’s Triumph table. This table is used by many happy customers and we are sure it will have many more in the future because is it’s a well-made table for the money you pay. Here are some specifications for you. It has 5” sturdy leg levelers which have a rubber bottom. A front ball return and slide scoring are on each side. It can be a 1 goalie or a 3 goalie design. Depends on player preference (included in kit). 8 durable stainless steel chrome-plated rods will make your game smooth. You’ll also get 13 red and 13 blue counter weighted foosball men and a set of 26 uniformed men, 2 Kick Premier and 2 soccer balls, 8 No slip wooden handles with screws, an option to set up 2 chrome cup holders and a free rod lubricant (upon request). Another thing that is awesome about this table is that the KICK brand offers you a lifetime warranty. Really a table to consider if you are looking for a high-quality table for a reasonable price. 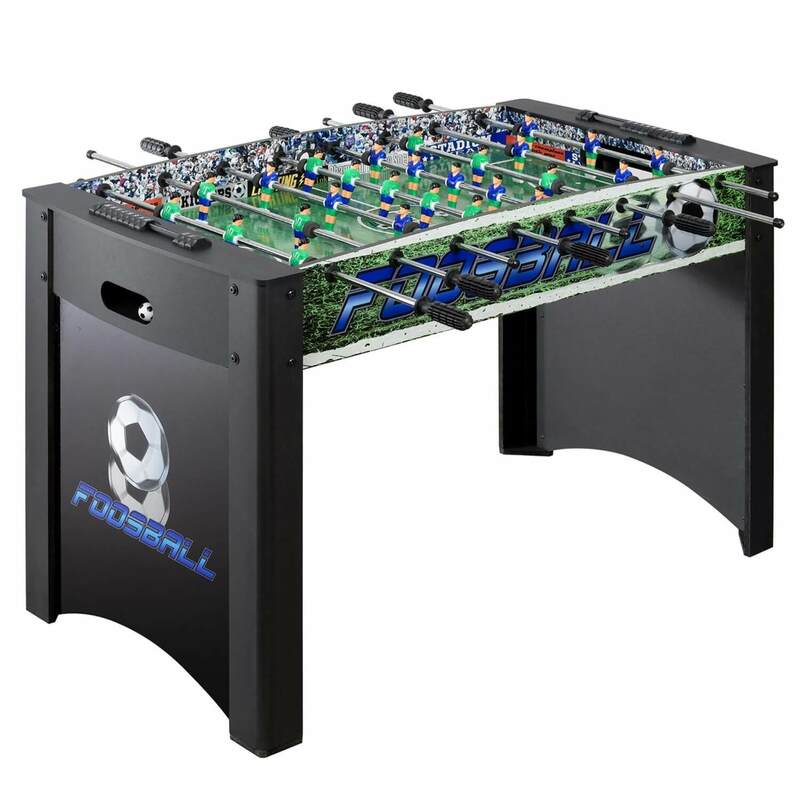 Let us present you one of the best foosball table which are available on the market. This is a single goalie table which has 4 leg levelers which are adjustable and strong legs for stability. It is built and will handle the toughest and intense play. It also has chrome-plated steel rods which are also heat treated to better quality and a play without worries. Includes also an Abacus scoring unit that has a counting score for a good play. Here comes another high-quality product. It has telescopic rods with high-quality steel which is plated with anti-rust chromium. What is great about this attractive beauty is that you can use it outdoors easily, because it is water resistant and there won’t be any problems while it is under the sun. It has a blue and gray player which is molded directly onto the bars and they not move and cannot be displaced. It has Abacus scorers. With this pack you get also 10 white balls and a waterproof protective cover, to protect it when not in use. Single player goalie. This is another great model by Garlando brand. It has leg levelers to provide an excellent flat playing field and 4 x 4 cm metal legs which are protected, so any external factors won’t damage it. Also, has high-quality resistant steel bars with anti-rust chromium plating. You will also get a waterproof cover to be even more protected. It also has anti-rust roller bearings made of steel to provide a good game speed and reduce the stress in player’s wrists. This is a long table which includes leg levelers for stabilization and durable legs. It features a Versa formation technology, which provides easy snapping of the plastic player on and off, so you can make your custom formation. It has steel rods which are chrome plated and banked corners. Includes two manual sliding scores, 2 foosballs. Also a one-man goalie. Here is another high-quality item with its unique and attractive design. It has crossed metal beams which support the top and an industrial metal trim cabinet. Its leg levelers are adjustable, so you can adjust it to have the perfect flat playing field. Above you have found some high-quality models, but maybe you don’t like them or maybe you want to choose one on your, but you don’t know how? Don’t worry, we will help you. What are the things you have to look? Firstly we think you should always look at the quality of the product. If you order a quality product, you are almost sure you will have it for a longer time. Wondering how to pick a quality product? There are some ways how you can pick them even if you are a complete newbie. What is good is that you check around the web or locally and ask people who own best foosball table worth buying for their opinion and reviews. This is a little bit time-consuming but effective. Better and easier way is to look online and search for different reviews and ratings. This is also time-consuming, but quicker than searching locally. After all, you don’t have to worry because we have done all the research for you, you just have to look at around our website where we listed quality items. Ratings and Reviews are important when choosing! You should also look at the material. This is important, because of two things. Firstly is important because you can use outdoor foosball table or indoor and because of that you need specific material which will handle external factors and stand as new in different weather. Next thing that we want to mention is the price. The price ranges have an important factor here and when choosing all other items. If you want to choose an absolute best foosball table you should have in mind that you should spend some to receive a high-quality item that will be durable and you will play the game smoothly. Another thing that is important when buying is the warranty of the product. Take a look what warranty the product has. Maybe you are in a dilemma and you don’t know where is better to buy it? It is better at a local shop or it is better to buy it online. We think that is better to buy it online because you can find more great and helpful ratings and reviews. Plus that you can see and check more models in peace without any hurry. We have also found a great buyer’s guide video about how to choose your perfect one, take a look at it below. Don’t know who can use it? They can be used by everybody. They are good for kids as for adults who want to have fun with their friends for home use or play professionally at different tournaments. This is a great item which you can use it almost in all places and which can bring a lot of joy and happiness to the environment where the table is located. Don’t know which brand to choose? There are really a lot of different products available on the market, which are made by different brands. Maybe you are wondering who makes the best ones? Because of that, we here listed some of the best foosball table reviews. Take a look at them here and if you are interested in any just click on the name of the brand. Are you looking for a specific type of foos table? Are you looking for a small one or for a full size? It depends on you which size will you choose. This refers to where you will use it, who will use it or which size do you like more. Looking for a best or certain price? When it comes to the price, we think everybody is always looking for the best for the money. Everyone has its own available budget which he can spend or he wants to spend. Let me here remind you one more time that if you want to have a quality foos table, you should most times spend more. You have to be really lucky if you find one which is available for sale. This is great because you can get a cheap table of high quality. We have also listed some of the best foos tables under different prices and you can find more just by clicking on your most suitable price. Understanding your budget and knowing what you want to buy is the first advice we give. 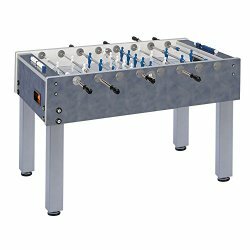 Purchasing the best foosball table under $100 is not hard but you need to know what to look for and the quality table you will acquire. These tables are quite cheap, so we need to be really careful about their quality. Size is important when shopping on the best foosball table for the money on a predefined budget. If you seek a standard size table, then look for a table length 56in and a width of 30in. This guarantees you get a comfortable play and is easily accommodated within the space you want to put the foosball table. Measure the space and do not forget to add the foosball table dimensions of the rods when extended and playing space. Consider if you want a table with a single goalie score or a three-goalie score. Some persons if new to the sport will not know the difference. Professional players like to play with a single goalie score foosball table, as it is more technical to score. This gives them the chance to test their skills. With a three-goalie score; it is easier to play and thus, children prefer this foosball table set up. The Sports Squad FX40 and the Sports Squad FX48 foosball table identifies with this price range. It is perfect for children and in our estimation is sturdy enough for the rough play kids are known to make. The construction of this table is of a high quality, surprisingly, and for the solid built, the price is a steal. Purchasing the best foosball table for the money it is important you do your due diligence in research. Asking questions and advice from experts is a good route to take. The professionals are able to tell you of their experiences on various foosball tables so your decision is from an informed perspective. Our review on the various kinds of foosball tables and the price range for the money is geared as a layman’s guide to purchasing. A professional is also able to use this information in purchasing as they determine need. The game of foosball is fun; children and adults have enjoyed playing this game for decades and will continue to do so a long time from now. The information here will only enhance your playing pleasure as you purchase the best foosball table for the money. The KICK’s Monarch table is a great table for its price and besides that, it has another extra thing, it’s folding. That’s an awesome way to make storage possible in different ways and in different places. It can be also stored upright. Customers who have bought this table find it as a good choice for its price and well designed. The assemble time varies from person to person. Some set it up really quick others take up more hours (2 – 6 hours). This is an elegant and durable table which has a folding ability, so it’s easy to store it. The Hathaway Playoff Foosball table is one such table in this category. It is a 51 pounder that is 41.5 inches in length, 23 inches wide and has a ¼ inch thick MDF surface. The beautifully detailed graphics for the surface markings, with a smooth green surface for quick playing and scoring, is a steal for the price quoted on Amazon. Rods are made from steel which is chrome plated and has rubber handles for accurate grip during play. The table has automatic end ball return features which will enable fast play without having to manually reposition ball during play. The playing men are unique, as they look lifelike and have playing feet for accurate effect at goal shooting. The players are able to affect difficult playing techniques that only professional players are known to make. The Hathaway Playoff Foosball table is designed for kids, teenagers, adults and any foosball enthusiasts that may just want to play a spirited game at home. The MDF particle board material may not be the strongest table ever made, but it is ideal for kids and teens because it is not a full sized table, and great for just learning the game. Many adults have certainly gotten hours of fun from playing on this foosball table, so it is safe to say not because of the price, it is truly worth having. 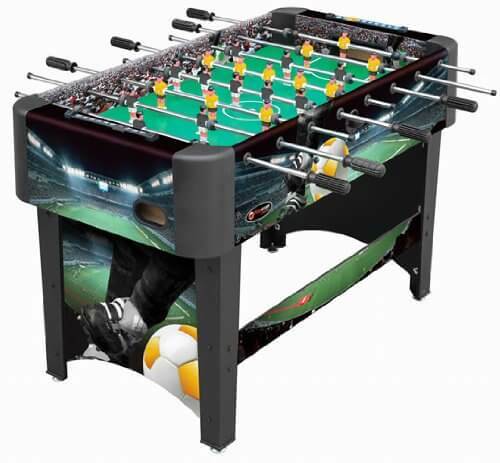 This is an ideal foosball table for the game room or any small space that you desire to fill with an entertainment piece; which will last for some years and gives many hours of fun. This foosball table is a definite table you will want to have to add to your game room. The size is relatively small for a foosball table you may have had experiences with, but this should not be a deterrent. Products by Playcraft have been known to be of excellent quality, and will certainly not disappoint. 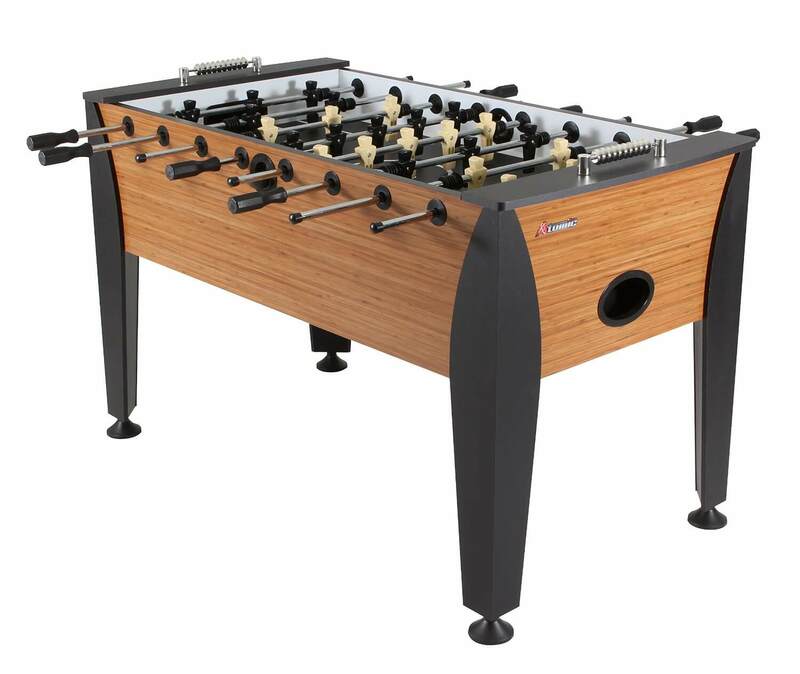 Reviewed by customers, they have found this foosball table to be at the highest end of 5-star ratings, which is about 50% of the customers who have made the brave plunge to purchase one of these tables. The Playcraft Sport foosball table has been touted to be the greatest gift for children as little as seven to 70. 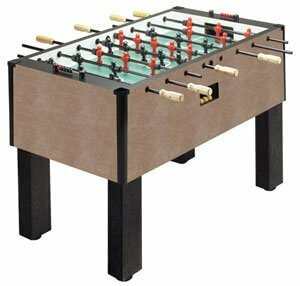 This is because for the general public who enjoy a good game of foosball at home, are able to do so on this sturdy table. Although this foosball table is manufactured in China it is safe to say it is worth the price. Table construction is relative to the use, which if purchased it is guaranteed to last as long as it is not abused beyond manufacturers’ specifications. This foosball table is not made with the same strength in materials that professional foosball tables are so it will not have the amount of playing potential. An American Legend Charger Foosball Table is specifically built for home use and kids, children and young teens will get a lot of activity out of a table of this caliber. This does not mean adults cannot play this foosball table; they are able to have just the right amount of fun as the kids will. The difficulty or ease in assembling will be determined by who is doing the assembly. There are some owners who have had an easy time assembling while it is more difficult for others; I guess this is dependent on the handyman’s expertise. Buying a foosball table under $300 comes with lots of challenges, especially if you are an experienced player. They generally look for the playing potential of every table to critique; which is OK. This is good, so as to give the inexperienced players a chance to understand and gain experience while playing. 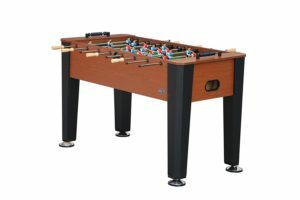 Buying a foosball table like the three mentioned above as stated, are generally for persons who just want their children to have fun while playing, learn the game to see if they like it; then graduate to a more expensive table, or to have a table game that is workable for friends and family. Nothing is better than having fun family time while parents bond with their children and these foosball tables will be the best ever. Some persons in reviews have given them 5-star ratings while some have given 4-star ratings. 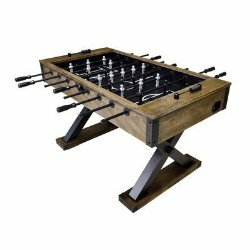 My thing is, if you are going to invest in a foosball table, it is incumbent on you to make sure the price you are willing to pay, for the reasons you wish to buy a foosball table is not determined on the cost, as many who have purchased any of the above tables have expressed surprise. The quality play they have received and the durability of the tables are more than worth the price. So, buying a foosball table under $300 will definitely surprise you while allowing you and your friends and family to have fun playing. Acquiring a foosball table is a big deal; especially if you are getting one to learn to play or for the family. Experts have advised that if buying a foosball table for the first time especially for home use, buy a cheaper end table. Buying a table that cost under $500 is a recommendation. 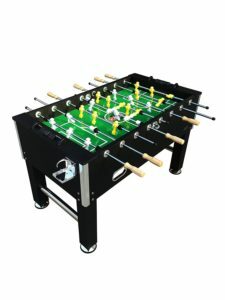 A foosball table within this price range will not only help in learning new techniques of play, but also in improving your techniques. The family is also able to get in on the action as they will be having fun while learning more about foosball. 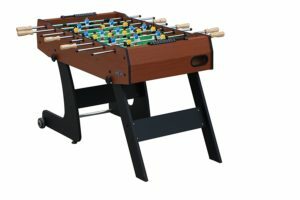 Here are a few reviews of foosball tables recommended for purchase under $500 which are considered good buys by the experts. 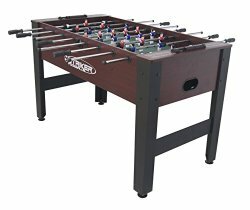 If you are looking for a good table that is not so expensive and it’s well built you should take a look at the Kick Venture foosball table. It’s a well-constructed table which is not hard to assemble. People who have both it say that is a great gadget to have which connects the whole family which is one of the most important things. 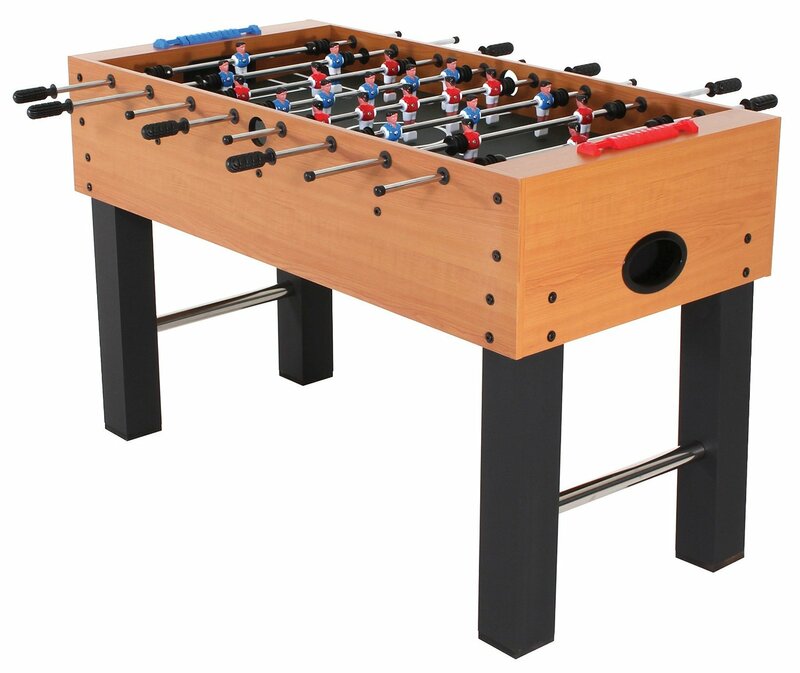 A durable and elegant table which is easy to set up can be a great choice for families who want to bring the awesome sport of foosball into the comfort of their own home and have fun times. Price is not always the criteria for purchase. Just knowing the facts about an item before buying and having all the needed recommendations is enough to make that informed decision. The Hathaway Foosball table is such an item if you are desirous of owning a foosball table. Many experts have said if you are buying a foosball table for the first time, then it is advised to buy one that is not of a high-end quality and makes. This suggestion is for the simple fact that you may not like the game after your purchase, and would have invested a lot of money for a table game you will never play. The whole reason to invest in a foosball table is to play the game with family and friends, for all to enjoy. The Hathaway Foosball Table is such a buy. It is made to deliver, at the level for beginners and for semi-experienced players. Children are able to play on this table as it is so designed for them. The many reviews on Amazon indicated this Hathaway Foosball Table under 500$ is a great buy. The price will be a bit deceiving, as to the fact that the table is so cheap, but this need not deter you from buying. The games played on this table are first class based on the many satisfied customers who have purchased this incredibly unique table. The potential of the Hathaway has far exceeded the expectations of many buyers, who are still pleased with their purchase. Though not suited for a professional setting, it is highly recommended for home play. The playing men are made to challenge any high end playing men, as they are found to have excellent control. The rods are said to have good control also, so the combination of plays is agreeably good. May is not realistic to try the most difficult plays, that you are accustomed to seeing during tournaments, but is still an excellent table game for enjoyment. The table moves around somewhat during rough playing, so if placed on a very level surface the problem will be greatly lessened. The Hathaway Foosball Table is light enough to be put away after plays and easily accessible when you need. It is also advised to clean the table properly, after all, plays, as to help preserve the credibility of the material, so you will have lots of game times in the future. 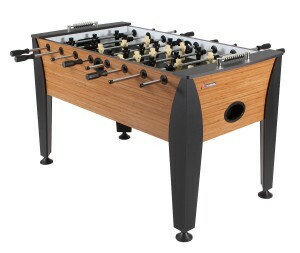 This is another foosball table recommended to be a great buy for the above-quoted price. It is really below $500 but the buy is well worth the money it sells for. 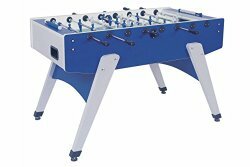 The Atomic Pro Force Foosball table is made at a weight of 144 pounds and is able to accommodate any rough play. Assembling takes 2-4 hours depending on the experience you have in assembling items. Customers have found it easy while others have difficulty in this regard. This is not a deterrent for foosball players who want to have a good game. A sturdy foosball table made from sturdy MDF or medium density fiberboard, this makes it able to withstand any vigorous or rough play. There are no dead spots during play and is accredited to the leg levelers and also the weight of the foosball table. The Atomic Pro-Force Foosball Table is built to give this quality play and more. Many foosball table owners find it an excellent addition to their game room and are a great way to break the ice with visitors. Owning an Atomic Pro Force Foosball table is excellent for children, enthusiastic teenagers, and beginners who want to get a feel for playing on a good foosball table. Professionals have gotten great plays as well from this table and are recommending it for beginners and home use. This table is another buy under $500 and is considered to be a great buy as well. This sturdy foosball table is considered a good buy for the price. Many customers have had second thoughts about this beauty, but after purchasing, they are not disappointed. Place in the category of being rated 3 stars; I believe this is not truly selling the potential of this table. It is more suited to be rated among the 4star category. Durable material and is expected to stand the test of time. Recommended for home play, and is excellent for beginners and children to learn on. High-spirited teenagers will also get great games on this table in the American Legend Charger Foosball Table as for the weight it can take aggressive play. Customers have indicated it is a great addition to their game room, as it is excellent fun for the whole family and friends who drop by for a good game. 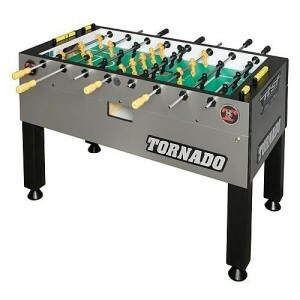 However, we hope you have find from the list of tables below your favorite and best foosball table under 500$. If you haven’t find it, you can look around on this website, so you find more great tables. Having a budget is never a bad thing. Budgeting before purchase is a smart way to ensure you don’t pay too much or too little for what you need. 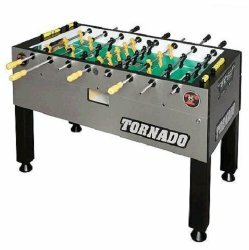 Purchasing a best foosball table for the money may take you through a wide range of prices from as high as $1000 to as low as $100, and all can be had on Amazon. With these prices in mind, whatever your budget, you are sure to be able to buy the best foosball table for your needs. 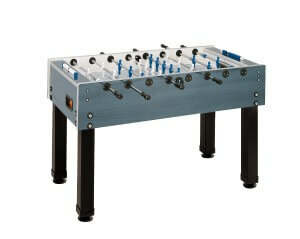 We will start the review from the higher end costing best foosball tables for the money. $1000 is just a figure for the range of prices we are considering for this category of our review. There are some foosball tables that may be had for as high as $2000. For the best foosball table under $1000, the choices are wide and varied; this is because the price is not geared for people who are serious foosball players. The quality may be lacking, as manufacturers have sought to make a good foosball table, but not the best. Their materials may be questionable as to the bearings for the rods, which may give you a good play and also have fairly good balance for the playing men. The Carrom Signature Professional as a suggestion, we have found to be one of the best foosball table for the money; just a bit below $1000 but it ranges within that class for quality. Although below the focused cost, it is manufactured like the professional players table with very high-end bearings and a sleek finish for the table surface. 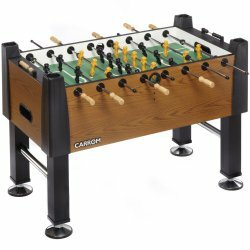 For the Carrom foosball table, our research has determined, to play a great foosball game better than the other tables within the above price range. Do you already own a soccer table and you just need some accessories, because they broke or you just want to have extra items to be safe? We have also that covered and you can find more parts here. If you are Interested you can check covers, foosballs, bearings. Of course, all things cannot go right and because of that, there come problems. One of the popular problems is how to foosball table setup, but there is no worry because we have also that covered. If you want to read more about care and maintenance check our articles. Now you have come to the end of this page where we tried to guide you, so you choose an absolute best foosball table by looking at different reviews and other things which may have an effect on your decision or may bother you. We hope you now know enough how to choose it, so now is the time to take action and order one or two. If you still aren’t confident and want to have a look at different models check our reviews section for more reviews of different models. 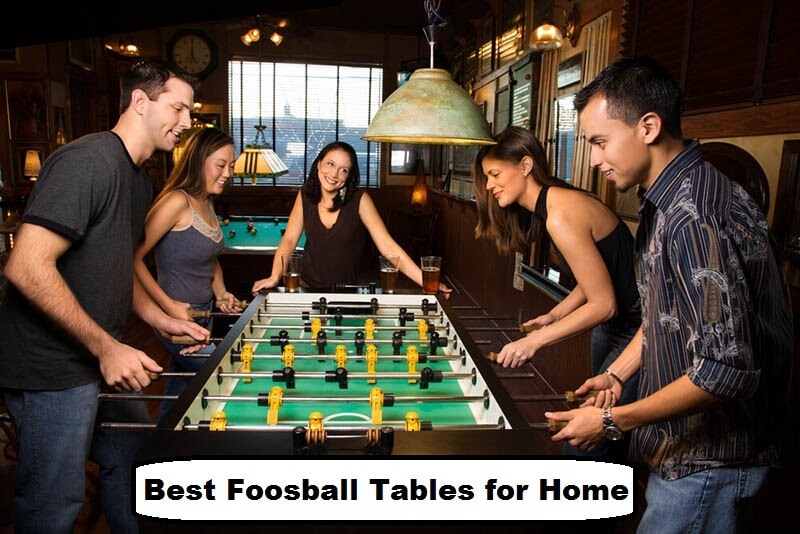 Wanting to purchase a best foosball table for home can be very overwhelming. The many choices out there on the market are staggering, and without having some knowledge about foosball table quality, it can be difficult. Professional foosball players will tell you that the best table is one which will last for a very long time. While this recommendation may be true, it is not practical for a homeowner who is working on a tight budget, or who just wants to have a foosball rules game in the home for light fun and enjoyment. If you want more foosball tips go check our guide section. While taking into consideration the cost it is also important to think about the members of the household. If there are children of varying ages in the home, it is practical to look at tables that are high or low enough to accommodate the size of the children living in the home. If they are only teens at home then a more standard size foosball table will be ideal. For smaller children it is recommended to get a table that is built to protect the little ones from injury of rods poking or prodding them; the face and upper torso of utmost importance for protection. There must be enough room for play and will accommodate the table of choice comfortably while playing. While extending the rods during play; there need to de lots of arm room which will accommodate the rods extended and your elbows during play. The foosball table cannot be too big for the space you want to put it. Many persons buying a foosball table for the first time will want to also consider the reasons for the purchase. If it is for the children to enjoy along with family, then purchasing a foosball table that is not too expensive is advisable. Thinking of the children’s likes and dislikes may be something to think about. If you invest in an expensive table and it is not well received by the children, then you would have a piece of furniture in your game room taking up needed space and not much else; so think of this before you buy. If the foosball table is well received; then you have a winner on your hands, which is sure to afford you and the family many hours of fun. Another thing to consider before buying a foosball table is how much do you know about the game. If you are a lover of soccer, then this is an excellent way to have fun during the off seasons, or during the season, when you are not able to go to a match. Having the table at hand will help to pass the time. Wanting to encourage the kids to learn about the game, because you had many hours of fun playing with your siblings as a child or during college is also another reason to buy a foosball table for home. They are able to learn the game while experiencing the fun you always speak of. Smaller, cheap foosball table are recommended for these adventures. If the kids love the game, then it is reasonable to want to invest in a higher costing table.